The following may be useful. I build Branchline kits whenever I can get them at a show or exhibition, North American outline - freight cars, 'reefers' (refrigerated freight cars, ice or mechanical), Pullman heavyweight passenger cars. Nicely detailed and fun to build. The freight stock kits used a weight method that is simple and can be applied to UK and North American freight cars and vans, and with some cover to open wagons. The system used stainless steel nuts, 3/4" diameter, and these are readily available at my local hardware store (4 for $1.00). The kits recommend CAA, I decided to use marine-grade clear silicone sealant used for boats, etc., but regular bathroom silicone sealant should be fine Keeps the weight in place, dries in about 3 hours, and can be easily removed by peeling-off the silicone. I also use the silicone sealant for flat steel weights if they are supplied with a kit. Some manufacturers kits have no weights (or trucks/bogies/wheels) so this is my method of choice. Any excess silicone can be trimmed off with a sharp blade. Should be good for 10+ years (the life of the silicon sealant). Photos below of a 1920's "Billboard" reefer for a long-forgotten Midwest beer that I'm currently building. No tripod, taken outside, focus a bit off on the first photo. 1920's 'billboard' reefer. Presumably getting blitzed on Blatz was a prime moving force for abolition. Hatches at the ends were where the ice went to keep everything cool. 3/4" stainless steel nut weights in place with silicone sealant. They are mounted over the wheel bogies for maximum adhesion. 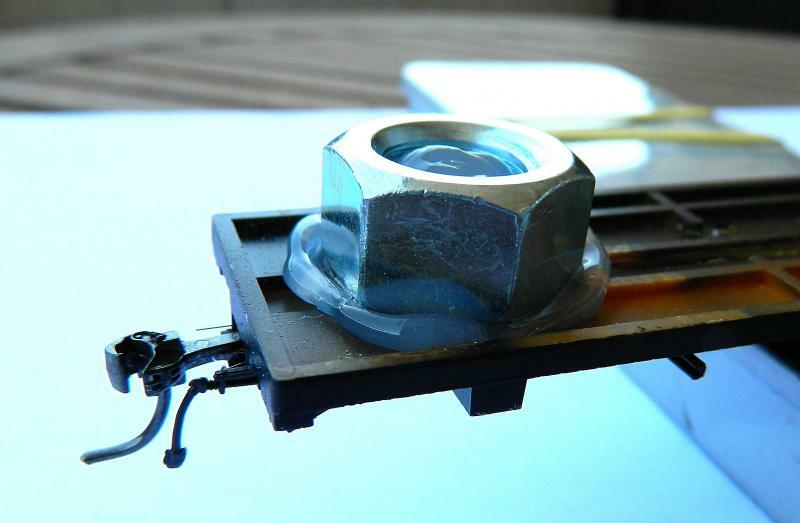 Using a blob of silicone means that the the nut is actually threaded into the silicone. For a 4-wheel van or small tender mount them in the middle. Larger vans (parcels) or tenders mount them at the ends. Fortuitously 2 of these will bring the weight up to NMRA practices. If a bit of adjustment is required I used stainless steel washers on top of the nuts and a smear of silicone. Darned sight easier than CAA to get silicone off my fingers and unlike CAA it doesn't damage paint or plastic! Last photo shows the fine-scale medium length center-set Kadee coupler and the air-line hose supplied with the kit. The trip pin is supposed to represent the air-line hose, it will be removed, as I do not use magnetic delayed uncoupling with my North American stock. I use lead for weighting my rollingstock. On average, I use anywhere between 17-20 grams of lead per 4 wheel wagon. This is glued in with Tarzan's Grip, an all purpose adhesive that will allow you to glue a piano accordian to an elephant..! Good strong adhesive that requires a good 24 hours to harden. I used to use nuts, but found they came adrift after a while and rattled around inside my rollingstock. 2 years in and no nuts rattling around so far. Which is more than can be said for glued weights. I used to use plumbers lead sheet, but found that unless the surface was really cleaned of oxidation the adhesive (whatever it was, Gorilla is probably the equivalent here) set to the oxide coat, not the metal. I had to look up Tarzan's Grip - "...and it has been estimated that fifteen percent of the earth's land fill is comprised solely of once-used, and useless, tubes of Tarzan's Grip." Good for sales though. A bit like the tubes of silicone I use unless they are well sealed. There is an NMRA standard for weighting rolling stock - I have it somewhere but Sol's the brains who knows what it is. Most of the RTR stuff nowadays is far too light because they use plastic rather than diecast chassis. My problem is, where on earth do I put the weights on an open coal truck (wagon) ? NMRA plus 10% as I use sprung trucks. Coal wagons. Empty is a problem, although many when "empty' has a small pile at either end. One of the few places I would use lead shot (recycled these days), or just use a sheet cut to the dimensions of the floor and suitably scored to represent planks. Silicone sealant, not CAA, to fix in place. I recently refurbished some Pullman Palace cars (heavyweight clerestory passenger) that came with recycled car wheel lead weights used for balancing. Double NMRA weight recommendations. They now have nuts at either end in the toilets. When I was working in American HO, I bought strips of lead weights sold for balancing car wheels. They come in strips with 10gm/5gm/10/5/10/5. They also have double-sided adhesive pads. The weights are small enough to be attached out of view. Also found in the model railroad world, only in quarter and half ounces. You can get them in steel as well, much more health friendly. Nuts in toilets? Tell me about it. Even if they eventually come out you find they've used all the paper! I use bits of lead strip because I have a pile, though as i'm about to ballast, my 305mm to the foot 16ft keelboat that stock will reduce dramatically. Im not sure it needs to be Stainless, but buying four nuts at a time is an expensive way of doing it,. Buying a pack of 100 is much more economic long term. I have never had a problem with lead for a bit of added weight. I use the thin lead flashing used for roofing - cut and bent to fit - and then fixed with a hot glue gun. Advantage of the nuts is different weights with different sizes, and they work out cheaper then lead sheet and are far less toxic. Plus no oxide. Point taken Nigel. It will be interesting to see how long mine lasts. I have glued it into position inside the tank of a fleet of tanker wagons I made from kits. Best I don't drop one on the floor. I have had the lead for years as it was used to make fishing weights. Fingers crossed for longevity.